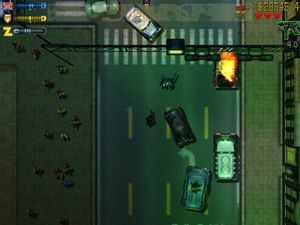 GTA 2 gameplay was via the top down perspective, as in all [[Grand Theft Auto 1|GTA 1]] titles/expansion packs, but due to the employment of early 3D tech, it exhibited smooth dynamic camera zooming, smooth [http://en.wikipedia.org/wiki/Sprite_(computer_graphics) sprite] rotation, and lighting effects from street lamps, car headlamps and emergency vehicle roof lighting. * '''[[Hare Krishna]]''' (symbol: an orange flower) - They appear in the third area and their car, the [[Karma Bus]], is a big love bus with flowers painted on its roof. The Krishna's turf is around their temple. Their boss' name is [[Sunbeam]]. They use orange as a gang color. This gang also appeared in the first ''[[Grand Theft Auto 1|Grand Theft Auto]]'' game (the player would earn the [[Gouranga]] bonus for killing them), but they were not involved in criminal acts. 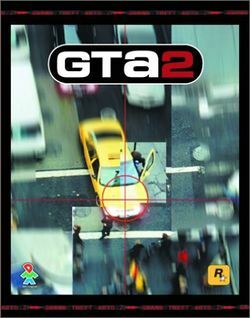 GTA2 was the last PC GTA with built-in multiplayer with the exception of [[Grand Theft Auto IV|GTA IV]]. It supported up to 6 players and connections via internet, LAN, serial cable or direct modem connection. There are also 3 small multiplayer maps designed for smaller number of players, as well as 3 districts with modified locations of weapons and parked cars.